Fill in the blanks with the correct vocabulary word or words. 1. 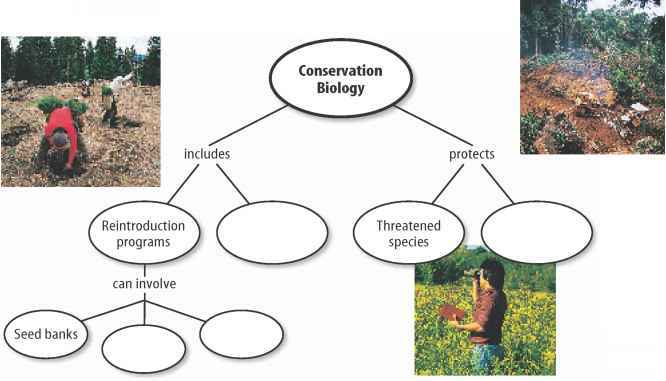 _refers to the normal changes in the types of species that live in communities. 2. A(n)_is a group of organisms found in a stable stage of succession. 4. The average temperature in between 9°C and 12°C. is are the most biologically diverse biomes in the world. 6. A(n)_is an area where freshwater meets the ocean. 7. What are tundra and desert examples of? 8. What is a hot, dry biome called? 9. Where would organisms that are adapted to live in slightly salty water be found? 10. Which biome contains mostly frozen soil called permafrost? 11. A new island is formed from a volcanic eruption. Which species probably would be the first to grow and survive? 12. What would the changes in communities that take place on a recently formed volcanic island best be described as? 13. What is the stable end stage of succession? 14. 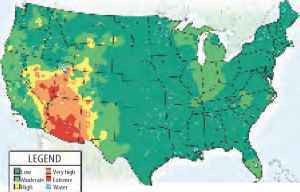 Which area of the U.S. had the highest observed fire danger on June 20, 2003? 15. Explain In most cases, would a soil sample from a temperate deciduous forest be more or less nutrient-rich than a soil sample from a tropical rain forest? 16. Explain why some plant seeds need fire in order to germinate. How does this give these plants an advantage in secondary succession? 17. Determine A grassy meadow borders a beech-maple forest. Is one of these ecosystems undergoing succession? Why? 18. Infer why tundra plants are usually small. 19. Make and Use a Table Copy and complete the following table about aquatic ecosystems. Include these terms: intertidal zone, lake, pond, coral reef, open ocean, river, estuary, and stream.